If you’ve been using a Mac for more than a few years, you’ve probably seen—and perhaps owned—Griffin Technology’s PowerMate, a chunky, aluminum “multimedia controller” (read: a large, solid knob that doubled as a button) that could be configured to perform various tasks. But as Mac OS X has evolved over the years, the PowerMate’s software didn’t, which for many people made the device little more than a stylish paperweight. 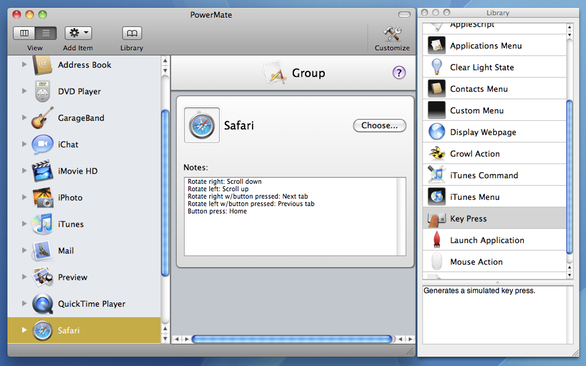 Hopefully you didn’t recycle or otherwise dispose of your PowerMate, because Griffin recently released PowerMate 3.0, a Snow Leopard version of the PowerMate’s software, and in addition to compatibility with Mac OS X 10.6, PowerMate 3 includes a number of new features. As with older PowerMate software, version 3 lets you assign actions to various PowerMate triggers: rotate left (clockwise), rotate right (counter-clockwise), press, long press (holding down the button), and press-rotate combinations. But you can now also use modifier-key versions of these triggers (for example, Command+press). This allows for many, many more distinct triggers. But you can also customize the PowerMate to perform different actions in different programs so, for example, Command+press performs one action in Safari and another in Mail. You then add a trigger to the desired group or application, and then add an action to that trigger—again, either by using the Add Item menu or by dragging the trigger and action from the Library palette. In addition to creating application-specific settings, you can also create entirely different sets of settings, each with its own global and application groups, and then switch between those sets. Unfortunately, switching between sets is more of a hassle than it could be—it would be great if you could switch sets using PowerMate 3’s systemwide menu. However, sets are also useful if you happen to have multiple PowerMate controllers. You can assign a different set to each device, so, for example, pressing the PowerMate on the left side of your desk performs a different action than pressing the other PowerMate sitting on the right side. A neat feature is the capability to choose how the device’s LED-lit base behaves: always on, always off, pulsing, or—based on the light’s brightness—reflecting the current system volume, audio-input level, or CPU load. PowerMate 3.0 does have a few limitations and glitches. For example, you can’t adjust the scrolling speed for the mouse-scroll action, and a few of the iTunes-menu actions—for example, switching to a different playlist—didn’t work for me. I also experienced an issue with multiple displays where my PowerMate “menus” started appearing on my secondary display, and I couldn’t figure out how to get them back to the primary display. (Quitting and then relaunching PowerMate 3 fixed the problem.) I also found that the Help system was missing information about some features, returning blank pages. But the PowerMate 3 software works well overall and is sure to be welcomed with open arms by those who’ve been wondering if their PowerMate would ever do more than collect dust. And if you don’t have a PowerMate controller, Griffin told me they plan to start selling the hardware again. When that happens, I recommend snapping one up. Even if you use it only for adjusting your Mac’s volume and controlling iTunes playback, it’s a neat gadget.